Maynard Paton | Tristel: Is There A Further 46% Upside? Click here for my previous TSTL posts. In fact, I was correct to assume “further AGM ‘sandbagging’”… and H1 sales did indeed come in at my predicted £7.4m. My H1 profit guess of £1.1m would have been spot on, too, were it not for a £67k staff-option charge. Previously this goal was revealed only in shareholder presentations by way of a 17% annual sales growth target. The goal now indicates sales could be at least £20.2m for the year to June 2017. Sales for the year to December 2014 were £14.4m. TSTL confirmed its 15% operating margin target would be exceeded in the next few years if the aforementioned sales growth targets were met. In fact, I had been predicting margins would increase to 17%. However, reaching 17% is unlikely to happen now as TSTL has since decided to “maintain the target at 15% over the medium term” so it can “invest in new products and markets, including, when we are ready for the challenge, North America…”. The Holy Grail for many TSTL investors is for the business to prosper in the States. As I understand things, all sorts of costly regulatory bridges need to be crossed before TSTL’s products can be sold Stateside, and working with a deep-pocketed partner might the most sensible approach. TSTL’s products currently face new European regulation. a) Smaller competitors are not as prepared and “there is a significant opportunity for Tristel to gain market share over the coming years”. The upshot could be no loss of sales and greater profitability from the core, higher-margin chlorine dioxide products. Sales jumped 15% to £7.4m, operating profits advanced 41% to £1.0m and net cash increased to £2.9m. In particular, I was pleased the latest H1 profit of £1,022k almost matched the £1,096k profit from the preceding H2 — which does seem to be the ‘seasonally’ stronger half. Furthermore, sales at the group’s largest division, Human Healthcare (HH), witnessed H1 2015 sales gain 14% to £6,322k from H1 2014. Back in December, I noted the comparable increase for H2 2014 was just 6% (to £5,982k), so I am glad TSTL’s main profit earner still appears to be growing well. I see operating margins were 14.7% during the year to December 2014 — already very close to that 15% target. * My estimate of surplus net cash is currently £2.9m or 7p per share. Enterprise value (EV) is thus £30m or 73p. * Operating profit for the year to December 2014 were £2.1m. 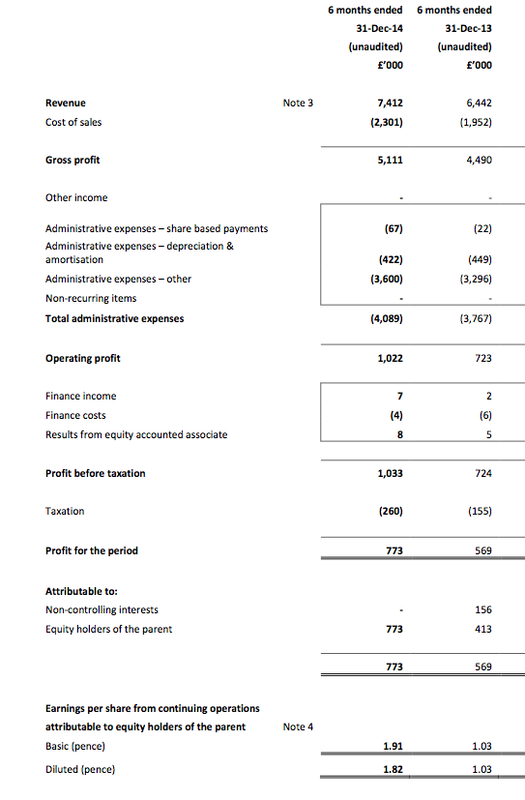 Taxed at the 26% seen in these H1 results gives earnings of £1.6m or 3.85p per share. * I was previously projecting 2017 sales of £18.2m and 2017 margins of 17%. But the chairman’s latest update now prompts me to assume 2017 sales of £20.2m and margins of 15%. * Then applying tax at the 26% seen in these H1 figures gives me possible 2017 earnings of £2.2m or 5.5p per share. But applying tax at the UK standard 20% gives earnings of £2.4m or 6.0p per share. * Applying a P/E of 17.5 on those EPS estimates to reflect the growth expected during the next few years, I arrive at a possible value of about 100p per share for the underlying business. * In addition… the latest H1 statement implied a current-year dividend of 2.34p per share, which should provide an extra 5p per share or so during the next two years. I reckon the net cash position could increase by a further 5p to 12p per share, too — assuming margins do indeed average 15%. * So… 100p plus 5p collected via dividends plus 12p surplus cash gives a potential value of 117p per share during 2017. * That implies 46% possible upside, or annual compound returns in excess of 15%, from 80p… assuming my sums prove accurate and TSTL continues to boast impressive sales and margin potential! TSTL’s shares go ex-div on 26 March and the 0.585p interim dividend will be paid on 13 April. Next statement — probably a pre-close update in late July. * “Only company worldwide” supplying Chlorine Dioxide-based products for small medical instrument disinfection. * Still “huge growth opportunity” in the UK. TSTL supplies 80% of ear, nose and throat clinics in NHS, but just 30% for ultra-cavity ultrasound departments. “Long way away” before UK growth rates slow down. * 15% margin target — clarification: target to 15% in current year then sustain at 15%. ‘Profit’ beyond 15% to be reinvested in USA groundwork and European regulatory requirements. * No intangible expenditure — all development and regulatory expenditure is and will still be written off as incurred. * There is some seasonality with sales — apparently there are fewer hospital appointments in the summer as fewer people are ill.
* £4.5m of Human Healthcare sales in H1 were related to Wipes (vs £3.7 H1 2014). £700k related to surface disinfectants (vs £800k H1 2014). * Germany EUR1.5m sales. Australia £1m sales. * USA — “sits outside 3-year horizon“. * No acquisitions — planning only for organic growth. All told, nothing too worrying and some useful clarifications. Share price has responded well to the the updated results. Nice writeup, thanks. I hold aswell – hope the PI stuff is going well for you. I’m surprised to see the continuing share price fall despite the good results although over recent months this has been somewhat of a saw tooth trend. I am not sure why the price has fallen. People locking in gains for before the tax year end? Worries about the election and comments from Labour about limiting private-company profits from the NHS — http://www.bbc.co.uk/news/election-2015-32083668? Other bad news on the way? I don’t know. I have enough of theses shares already so I am not minded to add any more right now. I had thought the vague potential of US expansion would have kept these shares elevated for a bit longer. Oh well.